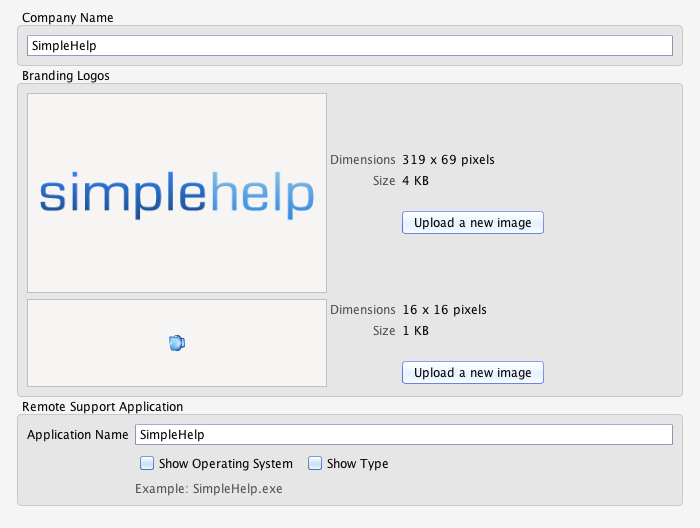 ﻿﻿This guide explains how you can brand your SimpleHelp website and apps with images and text. Please Note: For more information on how to brand versions before 4.2 please see this page. SimpleHelp provides comprehensive branding support including the ability to change the splash screen and text in downloaded apps and integrate the download buttons into your own website. A very powerful and simple way to brand your customer's experience with SimpleHelp is to embed app download buttons into your existing website. For more information on how to do this see the "Basic Integration" section in the Integration Guide. In addition to these simple branding methods, SimpleHelp also allows you to modify and customise both the download pages for your SimpleHelp apps and any text within the app. The following sections explain how. All the text that is displayed within SimpleHelp is translated into a variety of languages and is fully customisable. Each time a SimpleHelp application loads it queries the server for the translations file. These files are stored in the DEPLOY/translations folder of your SimpleHelp installation, and contain separate text files for all the supported translations. Create a text file in the configuration/translations folder using the language code that you wish to alter. For example, use a filename of en.txt if you wish to alter English translations. Copy each line that you wish to alter from DEPLOY/translations to your new file. For example, if you wish to change the text Login, copy the following line and alter the text after the = sign to make a change.